The perfect table runner for Christmas if you are a sparkle lover. 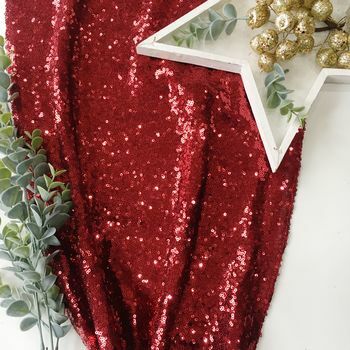 Add a touch of glamour by adding a berry red sequin table runner to your Christmas table. They look amazing on your dining table, sweet table or buffet - to add a little festive sparkle. They also make perfect gifts for friends and family, espeically those who love sparkles and sequins! Our linen is hemmed and machine stitched to the highest quality. The napkin holders are overlocked and handmade so each one may differ slightly. The sequin napkin holder is designed for a simple folded 22 inch (56cm) napkin, although you could use for other sizes, just fold to fit! 12 x 80 inches (30 x 203 cm) - the perfect size for home entertaining and just adding that touch of sparkle to your celebration or party. 14 x 108 inches (35 x 274cm) - ideal for celebration tables and suitable for 5ft and 6ft banqueting tables (both round and rectangle). Extra wide to add more sparkle. This product is dispatched to you by The Sweet Party Shop.